I'm looking for a certain state of awkward grace. It's there in the music of Thelonious Monk; it's there in the films of Buster Keaton; and it's there in certain minimalist and post-minimalist sculpture of the 60's and 70's: a sort of simultaneous manifestation and suspension of the laws of physics that allows the viewer to savor what's at stake not just intellectually, but in a fully embodied way. Though not usually thought of as funny, the physics of Richard Serra’s “One Ton Prop (House of Cards)” allows it to function as a kind of suspended pratfall: an idea poised forever on the brink of coming fully to ground. 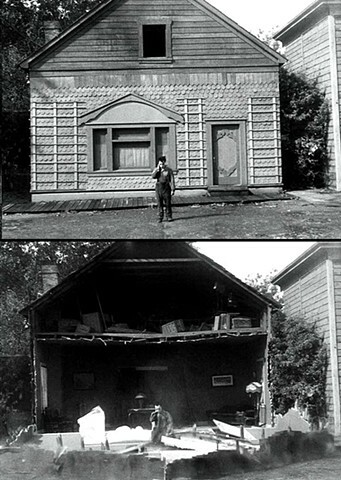 At the other extreme, in “Steamboat Bill, Jr.”, the comedy and pathos of Buster Keaton’s desire to redeem himself in his father’s eyes is registered not in words, but on his body (and by extension, on ours) as he plunges through a series of collisions and near-misses into the hurricane. This struggle between a work’s material conditions and what might be called its aspirations, has been a common thread in my work over the years, visible in the way the ephemeral (effects of light on translucent and reflective surfaces) and the provisional (the hang of stretched and draped materials) are both enabled and undermined by the necessities of gravity and structure.